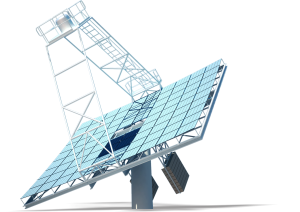 Solar thermal energy for cooking, laundry, cleaning, and hot water for domestic use. Clique Solar, India’s first solar boiler company, has installed world’s first large scale solar concentrator system that caters to satisfying the thermal needs in the hospitality industry. When hotels in the world are not even thinking of the negative impact they have on the environment, ITC has collaborated with Clique Solar in successfully commissioning two ARUN solar boilers and concentrated solar thermal dishes for fulfilling the thermal energy requirements. This installation has been operational for over a year now and it saves ITC an equivalent of almost 40,000- 42,000 litres of fossil fuel (furnace oil) per annum, which amounts to a reduction in CO2 emissions by almost 110 - 130 tons per annum! 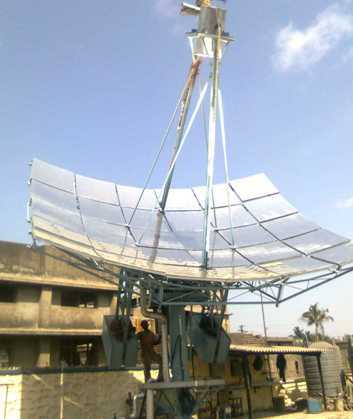 ARUN, solar boiler is an indigenous concentrated solar thermal system developed by Clique Solar. ITC Limited is credited with being a pioneer in initiating a number of environment friendly changes. It is one of the few carbon neutral companies in India. Clique Solar, India’s first solar boiler company, and ITC faced several hurdles when they decided to go for use of concentrated solar thermal systems to reduce the use of polluting fuels by hotels. There was no precedent of any such installation. There were issues ranging from economic feasibility to space constraints (being located in the heart of New Delhi!). There were even more basic questions like the best application of such a solar thermal system in a hotel keeping in mind the cost vs benefits and the integration requirement; how to hide such a system so as to maintain the aesthetic look of the hotel; and how to ensure that the system performs as promised, as many other concentrated solar thermal technologies are either dysfunctional or operating at very low efficiencies. Two ARUN solar boilers with a combined aperture area of 338 sq.m generate steam which is used for the hotel’s laundry, cooking and other heating requirements. One of these ARUN solar boilers is installed on top of the existing banquet hall, while the other ARUN dish is installed on ground in the backyard of the hotel with a footprint area of less than 3m x 3m. The civil engineering challenges were innovatively handled by our engineers. The ARUN solar boiler dish tracks the sun on two axes(East –West and North-South). Water circulates through the receiver coil which is placed at the focus of concentrated solar dish transferring the thermal energy from the sun to the circulating water and converting it to pressurized steam at 175°C at 8 bar(g). Step 1: At the start of the day, the concentrated solar thermal system (CST) (ARUN dish) draws water from the feed water tank to generate steam at 175°C and pressure 8 bars. Step 2: Steam delivery from dishes to various applications starts as soon as the required steam delivery pressure i.e. 8 bars &175ºC is achieved. Step 3: The dry steam is fed to the common header. It gets distributed to various applications from here. In the absence of sun, the existing boiler is used to feed steam to the common header. India’s first solar boiler company, Clique Solar, has successfully demonstrated the use of solar thermal systems in the hotel industry by installing two ARUN dishes at ITC, The Maurya for satisfying its thermal energy needs in laundry, cooking, bathing and other applications. Not only has the system been operating successfully, but the economics of the investment also makes a strong case for all hotels to install such systems. Contrary to being an eye-sore, the ARUN solar boiler system installation has been an attraction for all its guests, including the US President Barrack Obama!